In this guide we’ll look at the best camping chairs. This powder-coated steel camping chair by GCI is truly a must have for any camping enthusiast. Not only is it comfortable, but it’s a rocking chair! If you’re anything like me, you hate to sit still. You want to sit, you just don’t want to sit still. I am constantly shuffling in my seat, especially when it comes to camping chairs because there is really only one way you can sit in most of them. You can either sit forward like you’re at your desk in elementary school, or you can dangle your legs over one side until they start to tingle and fall asleep. Not anymore! This portable outdoor rocking chair is so comfortable. It’s borderline soothing. Seriously, you haven’t been relaxed until you’ve sat next to a campfire in this chair. The GCI has a sturdy steel frame that supports up to 250 pounds. The arms are slightly padded, and there’s a cozy little place to keep your favorite camping beverage! Because this chair is powder coated instead of painted, it is a bit more resistant to cracking, peeling, and chipping. A factory powder coat is abrasion, corrosion and chemical resistant. This isn’t a guarantee that the GCI won’t ever see a day where it doesn’t crack, peel or chip. It does give it a heads up on some of the competition though! This chair moves like a dream. Patented “spring action rocking technology”, whatever that might actually be, makes for a super smooth rocking motion anywhere outside, which is pretty impressive. 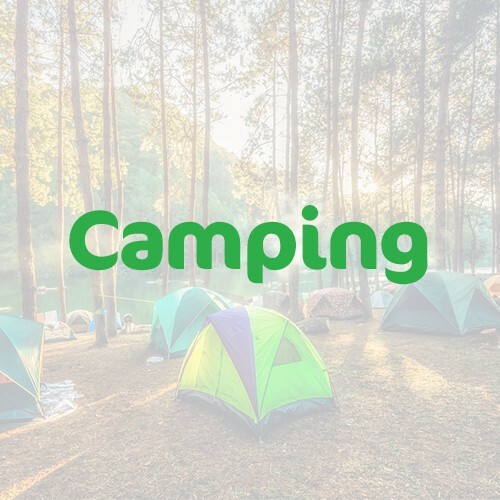 You’ll be able to rock successfully whether you’re in a parking lot tailgating, roughing it out in the woods or even just hanging out on your patio/lawn. No more of that boring sitting still for you. This chair opens and closes safely and easily with yet another GCI patented technology called EAZY-FOLD. With your carry handle and a limited lifetime warranty included, what more do you need? This chair has a weight capacity of 800 pounds, and I suspect that might be where it gets is name. Regardless, it’s super comfy and it has a whole bunch of space to store the things you require while sitting. The King Kong boasts an incredibly sturdy powder coated steel frame along with polyester fabric providing lots of stability and plenty of comfort. Each armrest is adjustable, and comes with a cup holder and side pocket for storage. Technically, you can fit even more than your phone and a drink. Maybe a book or magazine? The possibilities are endless! This super comfy chair folds up easily and comes with it’s very own shoulder bag. Unlike other chairs on the market, this one is easy to get in and out of the portable bag. It’s big enough to curl up in front of the fire with a blanket the aforementioned book. Heaven. Yep, it’s a camp chair made to look like a love seat – and it’s not the only one on this list either! Omnicore has a patent pending on this MoonPhase portable loveseat that “allows you to customize your ideal seating based on your current situation”. Your current situation is none of my business. Basically, you can sit side by side in your camp chair loveseat, perhaps while taking in the crackling fire or sparkling lake views. When you’re not feeling so romantic, you can shift the chairs into a half circle to make conversation easier and your friends feel less awkward. All kidding aside, this loveseat is super comfortable! Omnicore has designed it with double layered quilted padded seats, sloped arm rests and drop down cup holders. It’s also pretty durable as well, holding up to a 300 pound weight capacity per seat. 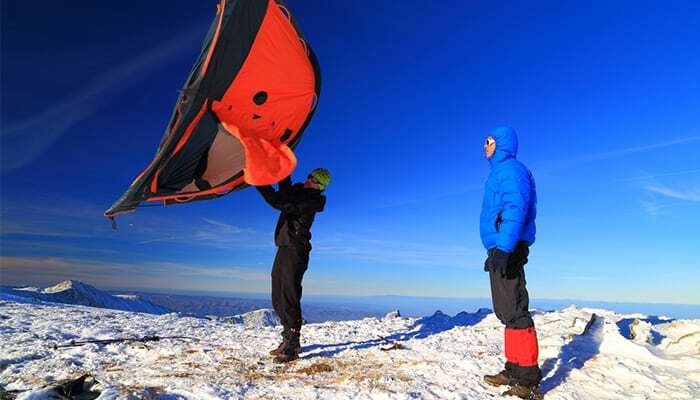 The seat itself is made of PVC polyester fabric, which is insulated and puncture-resistant. This cozy camp chair comes with a few perks, such as a built in bottle opener (face it, you don’t want to get up) and a backpack roll tote carrier. You can fold this seat up and carry it on your back for comfortable and easy transport. It’s another loveseat chair! I just want to note, you don’t have to share your Kelty loveseat camping chair (or any loveseat in general) if you don’t want to. I like to turn mine into a couch. Camping is supposed to be all about relaxing. This chair absolutely contributes to that comfort. The Kelty chair is slightly reclined, making it ridiculously comfortable. You’ll likely have a hard time not falling asleep on it. It’s soft as can be, made of quilted polyester stretched around a durable frame that will hold up to 400 pounds total. The armrests are adjustable, and (my favorite perk) the beverage holder is insulated. 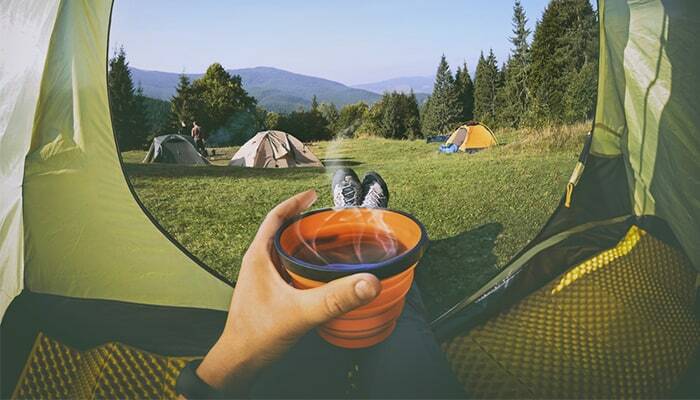 You might think that is unnecessary, but nothing ruins summer camping like a warm drink. The roll tote carry bag fits this chair easily for a quick pack up and convenient storage. I love the carry bag because while your chair is set up, you can use it for other things, whether it be a trip back to the car or toting firewood. 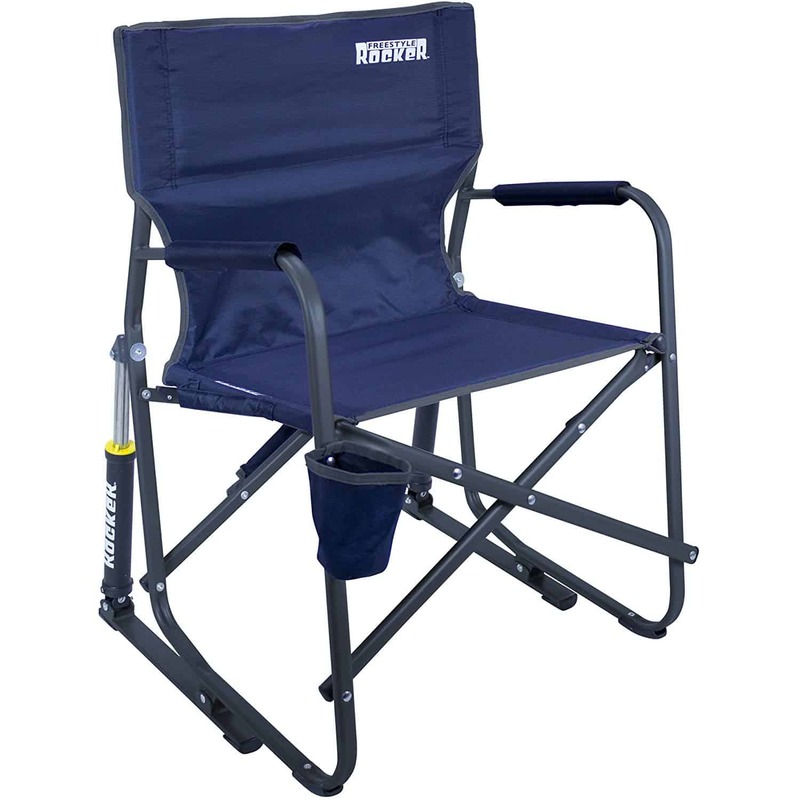 This camping chair is a classic by Timber Ridge. It can support up to 300 pounds with a super heavy duty steel frame. The polyester seating on the Timber Ridge is well padded and rip resistant. I have had this chair for a few years now, and it still looks like new. One of my favorite things about it is the larger seat. It’s really sturdy, and it’s one of those wonderful chairs with plenty of room to tuck your legs up in and get comfy. In case you haven’t noticed, I really prefer to be comfortable. It’s literally the point of camping! This chair is fully padded, and the cupholder is actually located in the seat, which I like. Cupholders on camp chairs, as most of you know, are usually located at the end of the arm. The seat is a genius place to put it, because your hand just kind of rests there naturally. The Timber Ridge chair is easy to store and collapse. The portable bag, which is kind of a must have for camping chairs, keeps it dry and ready for the next use. It also makes it a breeze to carry. Not to mention, Timber Ridge will back their products with a full 1 year manufacturer’s warranty against any defective workmanship. This chair by the outdoor pros over at Coleman is truly your classic, run of the mill, must have camping chair. While not as thickly padded as a few of the others on the list, this polyester chair is still completely comfortable enough for a night by the fire. Though it’s a little thinner, the back and seat are fully padded, so you’ll be able to spend quite a bit of time sitting in this chair without getting antsy or achy. The seat is super roomy, and you can definitely curl up in this one. I know I keep pointing that out but it’s important. You’re buying a new camping chair to sit in it, likely for hours at a time. While roomy is important, it doesn’t get much better than the built in four can cooler that will keep your drinks chill as can be, even in high temperatures! Sold! When you decide you’re ready for your next drink, simply pull it out of the cooler and place it in the mesh cup holder located on the end of the arm. You barely have to move. Relaxation at its finest! Do be sure to recycle your empties please. There is no littering in camping. This chair folds up and slides into its waterproof storage bag very quickly. You won’t have to struggle with it, and it’s easy to carry around, so you can use it for more than just camping. Bonfires, sporting events, concerts and picnics are perfect events for this Coleman chair. The seat is cozy and quilted, and though the arms are hard for support they are very padded, making them super comfortable, even for elbows. The frame is made of durable steel and it folds easily into the matching carry bag, complete with a shoulder strap that is almost as comfortable as the chair itself. You’ll have no issues transporting this camping chair to, well, anywhere you choose to take it. Of course, you’ll need a place to store your things, and what better place than the oversized gear pocket? Phones, earbuds, books and a couple snacks will fit wonderfully. The cup holder is also oversized, meaning larger water bottles will fit. CORE offers a 1 year limited warranty with this comfy chair for an added bonus! Sitting in the Sportneer chair next to a fire with a blanket is similar to being wrapped up in a cocoon. At least I would imagine it’s similar. This chair is so cozy! It has a nice, deep seat that makes you feel safe and somewhat sleepy. Not only is it cozy, it’s crazy durable as well. The frame on the Sportneer is made of heavy duty aluminum that ensures stability and quality. Despite the hardy frame, this chair is very light and compact. It can be folded up incredibly small. It won’t fit in your pocket or anything, but will measure up to be about 14.25″ x 5.25″ folded. It also has a carrying bag, so if you’re headed on a long hike and need somewhere to sit, then this convenient gem of a camping chair is for you. It’s so easy to tote around! 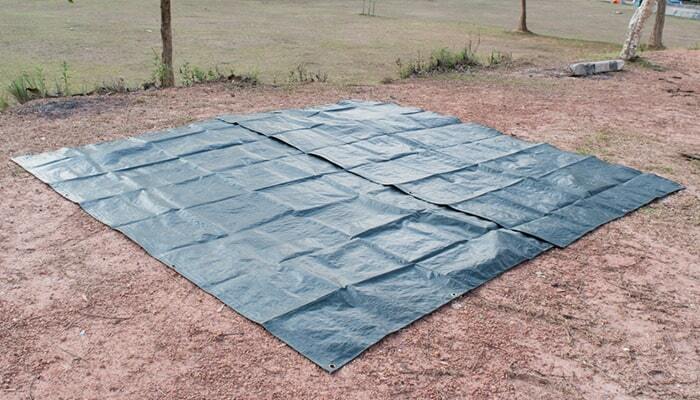 Since you’re venturing out into nature with it, you’ll want an easy, fast set up. No worries there. Sportneer as engineered an aluminum shock-cord pole structure, which makes for a quick setup. The back height here is a mere 26 inches, so while it’s easy to bring along, it might not work for those with back problems. At least to sit in for an extended period of time. That’s really the only downside to this easy-to-store chair. Keep in in your trunk for sporting events or family barbeques! While it’s not the most comfortable chair on the list, it’s definitely one of the coolest. It’s a classic directors chair, only it has a retractable side table. Stylish Camping has created this chair to be incredibly lightweight, with a flat aluminum frame that is easy to transport. It doesn’t have a carrying tote, but it’s not bulky, so you can easily tuck it under an arm. If your retractable side table isn’t enough, it has accessory pockets attached to the side of the chair, and they button closed. This is a great little addition since this chair is so lightweight. No worries about losing your phone in the lake if the chair tips over on the dock. Those who spend quite a bit of time outdoors will definitely find use for this fun little chair! Amazon has come a long way with their AmazonBasics line of home goods in the last few years, pumping out some consumer pleasing products along the way. This comfortable chair, made from breathable polyester, is no exception! It comes in a few different styles, including mesh, padded, and padded XL. Yup, extra padding. The seat and back on this chair are so comfortable, and that has everything to do with material and that delightful XL padding. The AmazonBasics chair has a cooler pouch similar to the Coleman chair, and will hold four, twelve ounce cans. This chair also has a cup holder for holding an open beverage and a good sized storage pocket for books and whatever else you require next to you. Made with a heavy duty, durable steel frame gives strength you can rely on. This chair collapses and opens so quickly that you’ll be shocked at how little effort you actually have to put into it. It comes with a carry bag for easy transport and storage, and is backed by that AmazonBasics limited 1-year warranty. It’s true that camping is supposed to be about roughing it, but you can get into nature and still be comfortable at the same time. 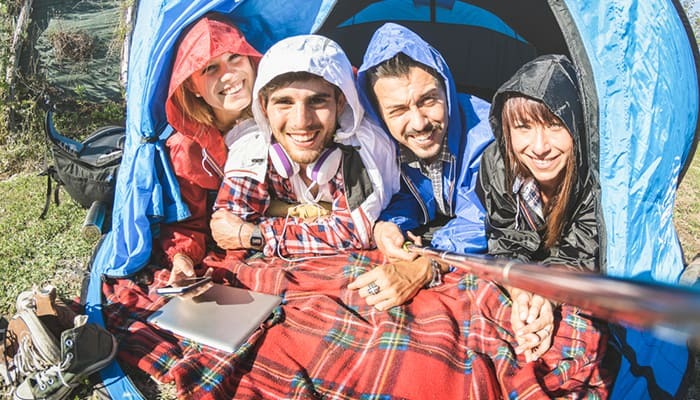 Just because you’re camping does not mean you have to sit on the ground. I mean, it’s borderline barbaric. Enter: the camp chair. Apparently, humans have been avoiding sitting on the ground for awhile, since the first official camp chair was invented in 1877. The camp chair has really evolved since then, and now come in all shapes, sizes and colors. They now come equipped with a bunch of bells and whistles, ranging from fancy built in coolers to basic cup holders. When you head out to pick out a camping chair, all you really have to do is figure out what you really want in a chair. It doesn’t sound difficult, but making a commitment can be relatively stressful. 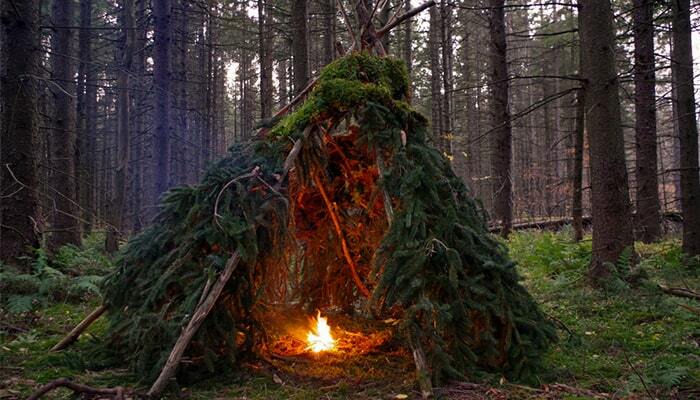 You don’t want to trek out into the middle of the woods and have an uncomfortable chair. Or worse, a chair that folds up every time you sit in it (this happened to me). Take a few minutes and really think about what aspects of a chair are most important to you. Maybe you want comfort, lots of storage pockets or a chair that is easy to tote around. No matter what might float your camping chair boat, we’ve got one on our list of must have camping chairs that will suit your needs. So pick one out and treat yourself! 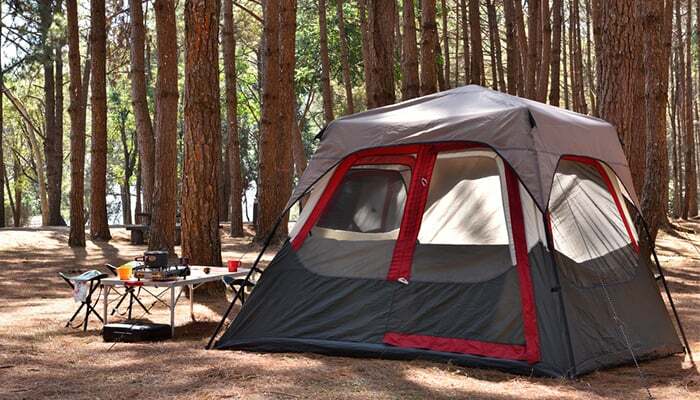 After all, since camping is your hobby of choice, you deserve to be completely comfortable while doing it. Camping chairs don’t discriminate against those who are new to camping, and they don’t cater to longtime campers. They’re chairs, after all. They will work the same whether you’re an old pro, or if you’re headed out on your very first excursion. The trick is to find one that works for you. While a new camping chair might seem like a relatively simple purchase, it’s a good idea to follow a bit of search criteria when you’re hunting for one. For starters, you want your new camping chair to be comfortable. Since you’ll be sitting in it for what might be hours at a time, trust me when I say you want a camping chair that will keep you cushioned while you’re taking in those moonlit lake views. Look for a breathable but durable fabric such as polyester, with as much or as little padding as you desire. Take all your comfort issues (back, neck, legs) into consideration…head to toe. Durability should also top the list of your camping chair must haves. There’s no point in sinking cash into something that won’t last! Don’t get me wrong, a camping chair doesn’t have to have an astronomical weight limit to be considered durable. Always take weight into consideration, but a nice steel frame with high quality, fabric and stitching will last a long time. Always go with polyester if you can. It’s soft, breathable, easy to clean and waterproof! Finally, choose a chair that is easy to transport. Look for something that is easy to pack up, that folds into itself and stays there or comes with a storage bag. This will ensure that you can get your chair where it needs to be without a hassle, and it will stay clean and dry when not in use. My top pick here is the GCI Outdoor Freestyle Rocker. This chair is so comfortable, and I love that I can keep one foot on the ground and mindlessly rock back and forth. It relaxes me even more than camping itself. The GCI is light, weighing only about 9 pounds, and is so easy to pack up and carry. It folds up so quickly, and it stays put once it’s folded. The built in strap makes this chair easy to carry a mile or two to camp. A powder coated steel frame and polyester seat keep this chair super durable. I’ve had mine for a few years now and it doesn’t show much sign of wear at all. A few scratches on the bottom where the chair takes the brunt of the rocking motion, but that’s about it. There are ten fantastic chairs on our list, but the GCI has always been my favorite. My tried and true go to for camping, picnics and family barbeques. It even lasted through a Sam Hunt concert. We had lawn seats and my sister abandoned it to get closer to the stage. My beloved GCI chair was muddy and trampled on by the time I tracked it down. It cleaned right up and still serves as my best camping buddy to this very day. The perfect camping chair is very much a personal decision. Everyone has a different level of comfort. If you head out to shop, online or in store, and have zero idea what you’re looking for, just remember to focus on comfort, durability and easy transport. Having a short checklist will make your shopping trip easier, and help you make a final decision when you’ve narrowed it down. It also doesn’t hurt to give yourself some wiggle room when it comes to added extras. Take pockets, coolers, cup holders and other luxuries into consideration. If you like to read magazines by the fire, grab the chair with the extra storage space. Maybe sipping coffee and watching the sunrise is more your thing, and you’d prefer a chair with deep cup holders to hold that travel mug. It’s all about you, my friends. This list is a great place to start, and if by chance you don’t find one here (you will, trust me), at least you’ll know what direction you’d like to take. Best of luck fellow campers! I wish you all the comfort in the world.